one may unfailingly arrive at his chosen goal or destination”. We know that planning a wedding can be overwhelming. There are so many details you will need to consider for the big day that at some point things may get out of hand. Well, thinking of all of you out there trying to make a wedding dream work read through our ten tips for wedding planning and relax because in the end, it will all fall in place. Thanks to the internet and the thousand wedding blogs and magazines out there, you can do an in depth research to your ideal venue and collect valuable insight from testimonials. However, photographs can only tell so much for a place that nothing beats going yourself to visit the shortlisted venues and deciding on your potential match. The best way to tackle planning, venue scouting, vendor suggestion, styling and all things wedding related is to hire a local wedding planner. It will save you so much time and stress that it will totally be worth it. Even if do not wish for a full time planner, consider hiring a day coordinator to do all the things you won’t have the time to think of while celebrating your love. As soon as you have locked your date and venue, you should delve into some serious research to find your ideal photographer and/or cinematographer. Those are the most sought after professionals when it comes to weddings so you don’t want to miss out on availability. Make some enquiries and try to set up a few calls to meet with them and ask all your important questions before singing up with a professional. After all, these are the people who will be with you the entire day – make sure you feel comfortable around them. You want to share this day with your nearest and dearest, hence, you need to keep in mind that there is a lot of planning and budgeting from their end too in order to be a part of your big day. Especially when there is travelling involved, people need to know in advance to make their travel plans and ask for time off from work. There is a never-ending inspiration when it comes to weddings due to the plurality of sources a future bride has at her disposal. From blogs and magazines, to the mother of all inspiration – Pinterest– there are so many ideas to get you inspired and help you create your dream day. However, don’t get carried away! The moment you find your personal style and vision, is the time you need to stop looking for more inspiration and start taking actions to bring your vision to life. If you find yourself pinning endlessly, you will get overwhelmed and be unable to take decisions. This is a nice idea and always a practical touch. Considering local blooms and seasonal flowers, is the best way to make the most out of the season and destination you are getting married in rather than spending a fortune to create something that may look out of place. 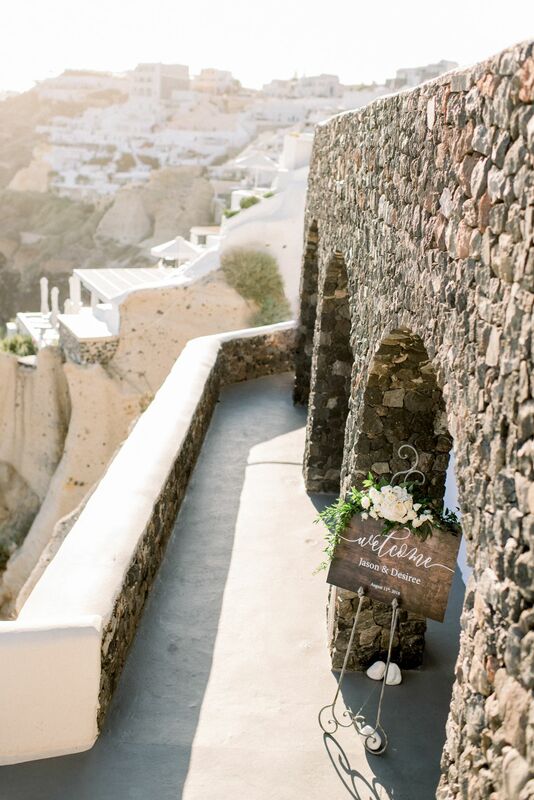 For example, if you are getting married in the Mediterranean you can use olive branches to the floral arrangements that will beautifully tie in with the surroundings. The easiest and most effective way to relay important information to your guests. There are so many templates you can choose from online and they are so easy to use – you don’t need to be a developer! Some websites even come with their own personalized wedding app, which sends live notifications to your guests in case of changes or other significant information you need them to know. It is important to say thank you to all those people who joined you in your wedding festivities. You should say so with a gift that isn’t necessarily expensive yet, is meaningful and guests can go back home with them so, nothing bulky or fragile. Think of something that will remind everyone of this beautiful day or something that is typical to the destination you are getting married at. You don’t need to get into a crazy diet or create an extravagant wedding look just because you are getting married. It goes without saying that getting into a healthier routine is wonderful and if getting married is the reason behind it so be it. Just remember to do this for your own good not just to fit in a dress or allegedly look good in pictures. Likewise, go for a wedding look that is you. For example, if you don’t usually wear too much make up then opt for a more natural, effortless make up look rather a stylized, editorial wedding look. It is a fact that weddings are made for brides more than anyone else. That said, get your future husband to help you with the playlist, or the signature cocktails for the night. Nobody expects grooms to give advice on linen or flowers but, this is a process you should both participate in. It will make planning stress free and you will both be happy on the day with the choices you made together. « Destination wedding photographer in Greece, a Hindu wedding in Colours!